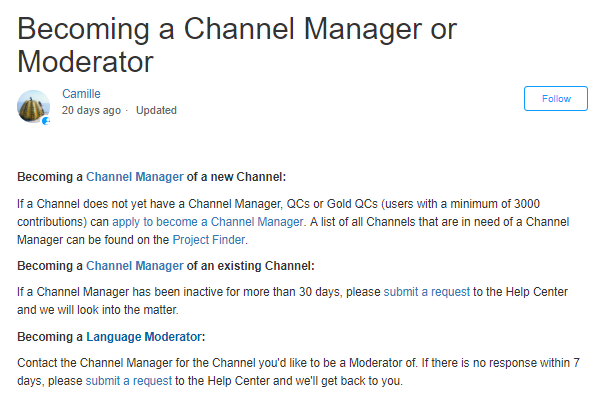 Is it possible/okay to become a moderator of a project if the original moderator is inactive? Recently I watched a Korean drama with Dutch subtitles. Many episodes had subs within the 90% range but it was still not enough to be complete. Also a lot of translation were totally wrong. I sent a message to the mod asking if the show will be finished and that I could give her the right translations for the wrong subs, but she has already been inactive for over a year. Can I take over the project if she doesn't respond within a certain time? Has anyone done this before? I'd like to have some advice about this. Be sure to give all the details (which drama, etc.) including a screenshot of the message you sent to the mod. They usually reply within 24 hours but you may have to wait a bit more since it's the weekend. It's quite common. A few months ago I wanted to sub on a channel with an inactive mod so I contacted Viki and they added me. You could also contact an all-language mod on that channel to add you as a subtitler but you won't be able to lock/unlock the episodes. Thank you for responding. I will look into that. 3) Contact Viki by filling a ticket: explaining them that you contacted them (screenshots) and didn't get an answer from them + links to their profile showing their inactivity since a long time ago. Sometimes, sending a message to the CM explaining her/him the situation is enough. Sometimes, it's the CM who seeks help because the moderator has gone inactive (not the case here). If I'm going to contact the CM or Viki to ask to take over a moderating role: stick to it until the end and don't reproduce the same pattern (otherwise, why taking over?). Giving myself a deadline that varies until 1 year max to finish it if it's a long drama, if terms are not common, if there's no help in subtitling, if I have other dramas too (a big margin but it sets a timing). Also, in general, the CM has faith in the fill-in moderator, that she/he will finish it and is enough skilled in his language (if she/he was to edit/subtitle it alone) or will recruit people who are enough skilled (editors above all). So before taking over, the question of competence has to be asked to oneself. We haven't usually met many subtitlers interested to finish old dramas or to finish one abandoned drama (because one of the reason is subtitling something in the middle, it's harder and it's a bother), so most of the time, you are alone to finish translating it (really lucky max 2 interested, really lucky lucky you have many subtitlers friends who agree). - When I'm lazy to edit myself and I don't have time or I don't want to care about preparing some document: I don't ask to take over the moderation, I negotiate with a friend to take over the moderation and I subtitle it while she edits it, prepares a document, locks episodes. Oh this info is really useful! Thank you for the detailed information. I already thought it is good manners to wait some time before contact the CM or help center,so I will just wait a few more days and then go into action. PS: there's a new function on Viki Community Support: "follow" categories if a new article is added in this category. (On old/abandoned projects, you can quite feel alone, but when you need peace without a short deadline, and there's no one to bother you with rules or you don't need to coordinate with people, it's also great freedom on the other side).